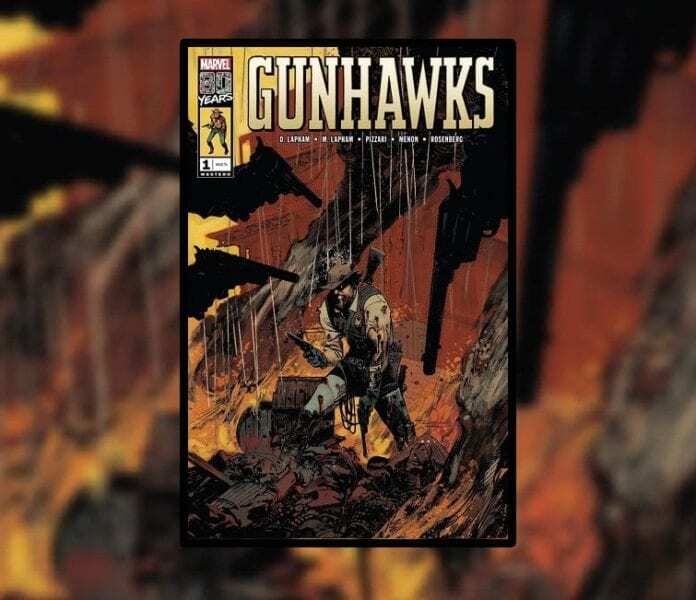 Gunhawks has the visual style of a Spaghetti Western and the narrative of a classic revenge story. The only downside to this comic is that it is a one off and not a continuing story. Welcome to Clearwater, Arizona and a Marvel Comics one shot: Gunhawks. This is one of the many comics that Marvel are publishing to celebrate their 80th year and the rich history of comics under their belt. 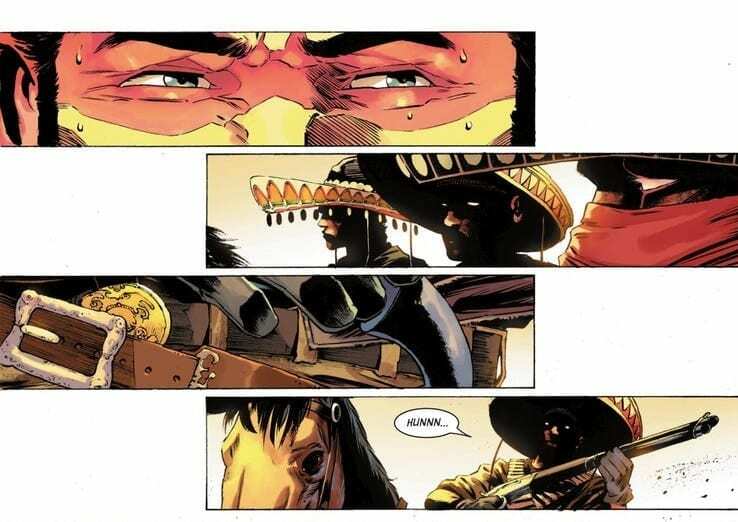 Gunhawks is a return to the Western comic and the violence that the genre brings. Westerns fall in and out of favour but often rear their head with new takes and new insights. The themes and styles of a western are often adapted to fit into other genres, it wasn’t too long ago that there was a Sci-Fi/western boom spurred on by the growing popularity of the fan favourite T.V. show Firefly. Gunhawks, however, is a return to the traditional format with hardened men and women struggling to survive in a harsh environment. Put on an Ennio Morricone album for atmosphere and open up the pages of Gunhawks. Gunhawks opens with a shoot-out and the, as yet unknown, problems that plague the central character of this wild west tale. Writers David and Maria Lapham introduce the reader to Dean ‘The Deadman’ Donnelly in a baptism of fire. This western trope is a perfect way to portray the main characteristics of the central figure while also setting up the main story. Dean is shown to be patient and friendly but it doesn’t take much provocation to make him reach for his guns. This aspect of his character forms the backbone of the story as the ensuing violence is merely a way for the writers to analyse the central character, and by association the heroes of westerns as a whole. Dean is the epitome of the western hero. He is a gunslinger turned lawman, carving out a new life for himself away from his past indiscretions. This tale reminds readers that history always has a way of catching up with us and it is how we deal with this that marks out our character. Gunhawks pays homage to the western genre but doesn’t shy away from the problematic issues surrounding the glorification of violence. There is a price to pay; a point this comic makes wonderfully. If you were to capture the aesthetic of a Sergio Leone film in a comic book format it would probably look like Luca Pizzari’s work on Gunhawks. The opening gun fight has 1960’s spaghetti western influences written all over it. The physical tension and nervousness before the shoot-out is superbly illustrated in a few widescreen panels creating a truly Western feel in less than half a page of art. From this point onwards, the art is exactly as you would hope it to be. There is an orange and yellow haze to each of the pages provided by Neeraj Menon and Rachelle Rosenberg’s colors. You can almost feel the rough grit against your skin and the unrelenting glare of the sun in your eyes. The atmosphere that the colors create is harsh and hard wearing. Over the top are Pizzari’s expressive inks and complex shadows. Pizzari fills the panels of Gunhawks with foreboding and uses establishing shots to create tension. Imagery is used to exacerbate the dread, for example the skull shaped out crop overlooking Deans homestead or the circling carrion birds. Every time that Dean is drawn with a gun in his hand you fear that he is going to use it. Some of the lettering is not up to the same standard as the rest of the comic and elements of the speech balloons impose on the art in some of the panels. Travis Lanham uses the space inside the balloons smartly; evenly spacing the dialogue. Unfortunately, some of the layouts force one or two of the panels to be crowded by the balloons. This however does not mar the overall reading experience and there is more to be impressed with than to distract the reader. Gunhawks is an old school western at its very best. The influences are obvious but they enhance the story telling not over shadow it. There is a moment where the hero strikes a passing resemblance to Clint Eastwood but this is just one of many visual references to the genre that makes Gunhawks feel authentic from start to finish. There have been a few western style comics over recent years’ worth picking up; ones that have been purely western and not mixed genre. Rebels from Dark Horse Comics and Loveless from DC-Vertigo are two worthwhile examples. This issue of Gunhawks is another. As a single, one off story, this is a satisfying read which incorporates everything you could want from a traditional Western comic. In a lot of respects, it’s actually a shame this isn’t the start of a new series. 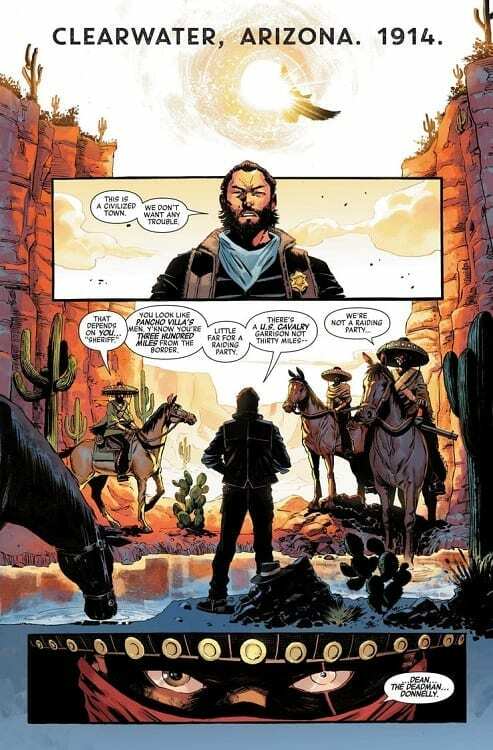 The artwork and narrative structure is impressive and appealing, and there is a gap in the market for a pure western comic.